New Delhi (IANS): Prime Minister Narendra Modi on Wednesday discussed a range of bilateral issues and matters of mutual concern with visiting Sri Lankan Prime Minister Ranil Wickremesinghe in New Delhi. Following the talks, an agreement on cooperation in economic projects between India and Sri Lanka was signed. “Held comprehensive talks with PM Ranil Wickremesinghe on ways to strengthen India-Sri Lanka ties for the benefit of our citizens,” PM Modi tweeted after the meeting, which was held at Hyderabad House in the national capital. External Affairs Minister Sushma Swaraj, Home Minister Rajnath Singh, and Transport Minister Nitin Gadkari also called on the visiting dignitary. “The discussions of the Indian leadership with the visiting dignitary provided both sides an opportunity to review the progress in implementation of the decisions taken during various high-level exchanges in the past two years or so, including the visit of the Prime Minister to Sri Lanka in March 2015 and the visits of the President and the Prime Minister of Sri Lanka to India since February 2015,” the External Affairs Ministry said in a statement. “The two sides expressed their satisfaction at the progress in implementation of the outcomes of these exchanges, which further strengthened the historically close and friendly relations between the two countries,” it said. The ministry said that the Indian side reiterated India’s commitment to promoting prosperity in the neighbourhood and affirmed the continued support of India for realising the vision of the Sri Lankan leadership for a stable, peaceful and prosperous Sri Lanka. The ministry statement said that both sides also expressed hope for an early conclusion to the ongoing negotiations on the economic and technology cooperation agreement. “Pointing out that India had welcomed Sri Lanka co-sponsoring the Resolution ‘Promoting Reconciliation, Accountability and Human Rights in Sri Lanka’ at the United Nations Human Rights Council (UNHRC) last month, the Indian leadership expressed the earnest hope that recommendations on the reconciliation would be completed within the stipulated timeframe of two years,” it said. The Indian interlocutors requested the continued cooperation of the Sri Lankan Government “for humanitarian treatment of Indian fishermen, without resorting to force under any circumstances”. “Indian side also informed the Sri Lankan side of the measures taken by India to encourage the Indian fishermen concerned for adopting deep sea fishing,” the statement said. 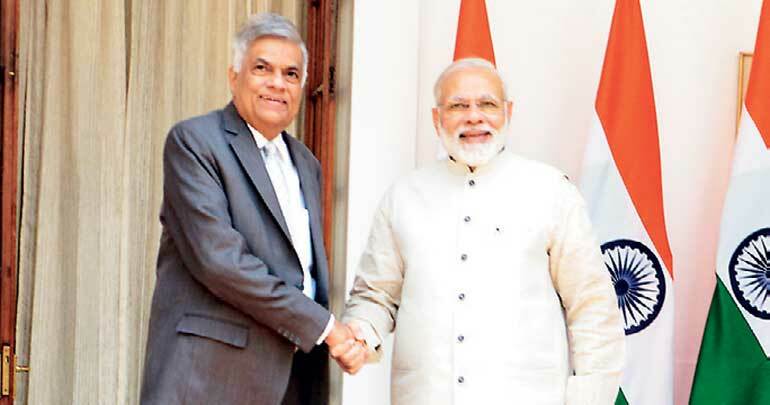 Wickremesinghe reiterated the invitation to PM Modi for a visit to Sri Lanka for the Vesak Day celebrations on 10 May. The Sri Lankan Prime Minister arrived in New Delhi on Tuesday on a five-day working visit to India.